We have been practicing Noah’s walking for awhile now despite him not even being 1 year old yet. We are far from him being able to walk on his own (although he’s inch-worming quite nicely! ), however he’s figuring out the concept quite well. We started on the treadmill back in August, and we do it twice a week at his physical therapy sessions. We spend a grueling 8 minutes on the treadmill. Noah is like his mom on a treadmill and he gets a bit bored. So today we tried something new. He's trying to get this walking thing down! Noah is easily distracted and it is quite a battle some days to get him to focus on the job at hand, specifically on the treadmill. 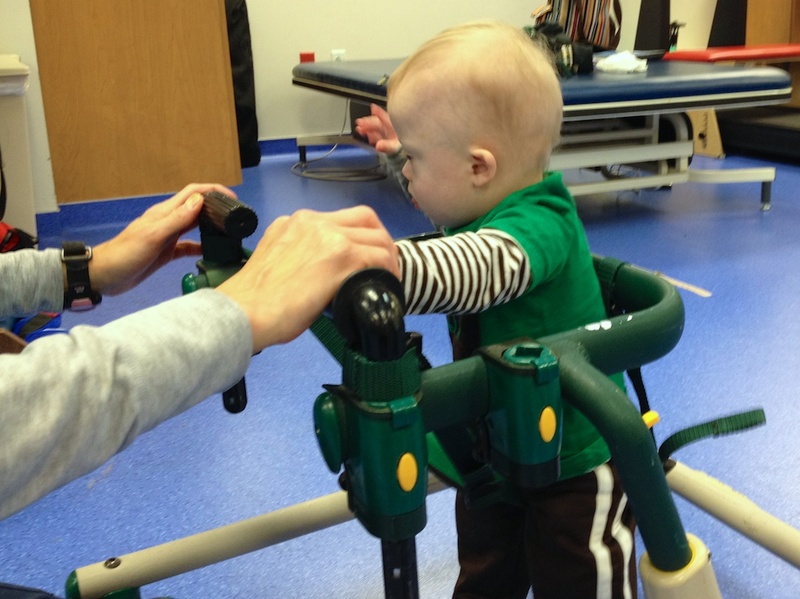 Our therapist decided to try something different today and put Noah in a gait trainer. 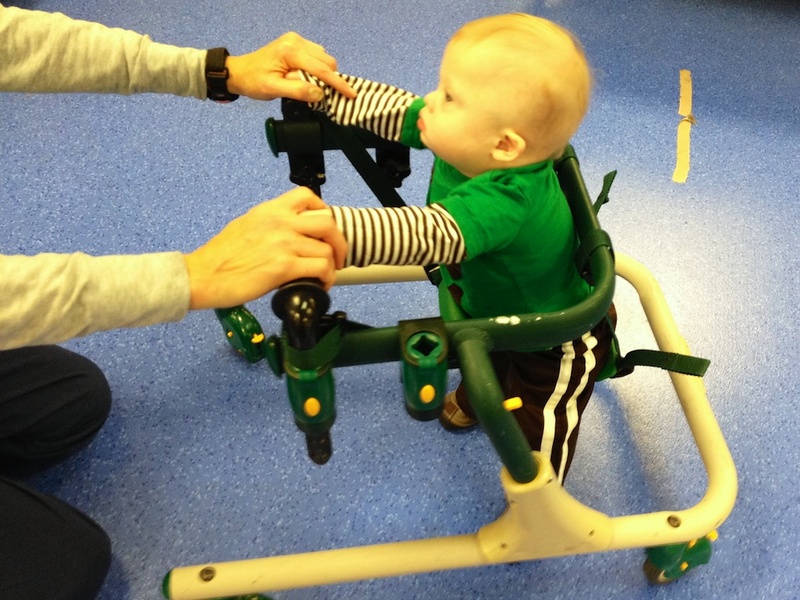 A gait trainer is a fancy contraption that is basically a walker with support to allow a child (or anyone having difficulty) learn to walk. I don’t know if I can describe a piece of metal as agile, but this thing moves any direction with just a little bit of effort, it is like the Porsche of walkers. I was quite impressed with how well he did, and I think he was quite surprised to see his world from this point of view. "Walking is way more fun than crawling!" This was the first time for us to see Noah walk off the treadmill. Noah doesn’t put his feet down to stand when we hold him up; however, with this device it gives him support underneath so that he can do that. A toy walker would not work for him right now as he does not have the strength to push up on his legs, but we are getting closer with each day. We don’t follow it exactly, but if you have access to a treadmill 5 days a week I would definitely give it a whirl. If using a regular treadmill, you just need a good bench and some strong biceps and you are good to go. We have a lot of catching up to do…. Has your child used a gait trainer? If so, did you get one for your house and how long did your child use it? Way to go, Noah! Our therapist has never used anything like this, and has only used the treadmill once, when I requested it. Crawling/walking seems to be where we’re making the least gain these days, but I know he’ll get it eventually! You guys are rocking! Maybe one day I’ll do a blooper reel and post all the therapy videos where Noah just folded his feet and wouldn’t have try to stand up….ha,ha! Patrick used a gait walker for a few months. His physical thrapist loaned it to them, He loved to go up and down the sidewalk, and it kept his interest much longer then just doing laps in the house. It really helped build up his leg strength. It is amazing how smooth it rolls! Wow, that’s really cool. It’s to bad they are so pricey. At home Noah uses the Dino walker that we posted on our top toy list. It’s no where near the quality of a gait trainer, but it’s been our favorite walker thus far. You better watch out he is going to give you a run for your money once he gets going in that walker lol. We are still working on sitting up. I think Otto is going to crawl way before he sits up. He folds his little body in half. It makes me giggle. But on his belly he gets up on his knees, sorta. He has mastered rolling over, which makes for difficult tummy time. But hey, he’s 7 months so we are doing just fine. I had no idea the contraption you showed existed. Looks great. I’ll recommend it to a friend of mine. Her son is 3 and could benefit from this for sure!!! Had the exact same thing in my classroom for years. A parent moved out of district and never came back for it. A few of my students used. Hopefully, it is getting used by another school in my district. I used to take my student to the gym during pe, and have him do a couple of laps. Our son broke his leg before he could officially walk, and guess what? We think the cast assisted him in learning the art of walking, because he was a full fledged walker when the cast came off! Noah is very cute. 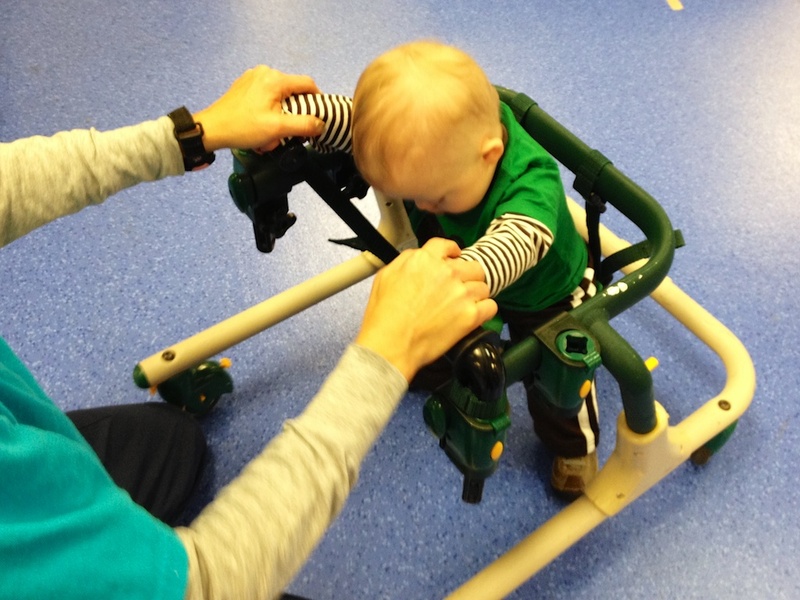 🙂 I am suprised by this therapy (not that we are anywhere near this level yet) but I thought that baby walkers were discouraged as they encouraged the hips to straigten, and that it was important for the child to learn to crawl first….. It just goes to show how much more I have still to learn, I must be missing something somewhere…..Have you published the protocol yet? Where do I find it? Many thanks for your website…. I love to find out what is happening over your side of the pond! Loving the walker, We get nothing like this in the uk at Physio, to be honest ours seems a waste of time but we percivere. I need some tips for crawling for my 15 months old Down syndrome boy .How can I motivate him tips , tricks or toys I need your suggestion. He is teething now so sometimes he is angry and lazy. No matter how hard we try he don’t like to stand. And when I push him for crawling he starts crying. Hope you understand my problem or should I ignore crawling and focus on standing he sits on chair as well.He tries to come in crawling position but after few seconds he sit back again.